Are you going to be in Madrid from 5th to 8th of November? Be our guest! This forum will connect local leaders, international organizations and networks, the academic world, NGOs and civil society for the reflection and construction of common solutions to promote a better urban environment free of violence. 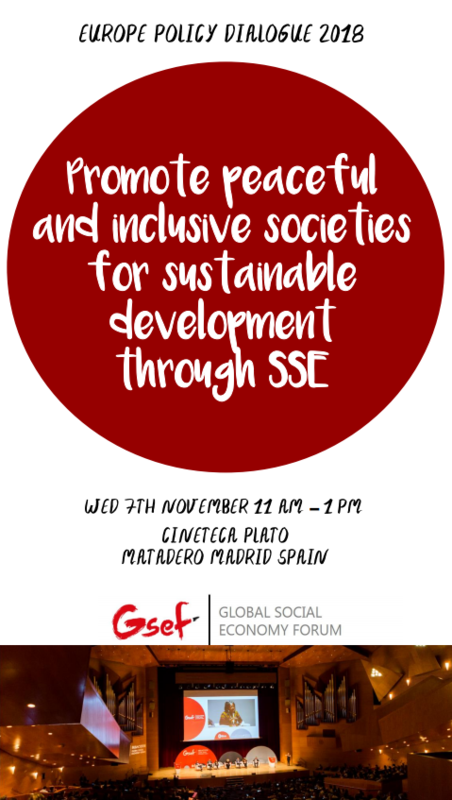 Moreover, on Wednesday 7th November from 11:00 to 13:00 as a thematic session within the Forum, GSEF will organize a workshop with the title of “Promote peaceful and inclusive societies for sustainable development through Social and Solidarity Economy (SSE)”. * Simultaneous translation in English, French and Spanish is provided for the session. Through collaboration between social economy organizations and local governments, GSEF pursues creation of quality jobs, fair growth, progress of grassroots democracy, and sustainable development. This GSEF Session, which will be also our 2nd Europe Policy Dialogue, will be able to bring both themes of achieving peace and sustainable development through SSE. Find attached the program for our session. We encourage you to come and join us!